I am from Internova LTD in Nottingham, UK. I am contacting you regarding the FCKEditor version 2.6.5 ASP.NET integration issue. Following is my scenario. We recently purchased SCAYT spellchecker for FCKEditor. Now if my understanding is right we can only use SCAYT in version 2.6.5 and higher. So we are using version 2.6.5 because it integrates well with .NET. Now spellchecker and everything works fine, however, we have realized that there is no source code or dll provided for version 2.6.5. So we are using the old version of DLL, available in version 2.6.3 pacakage. This causing us a problem while uploading image and other resources. 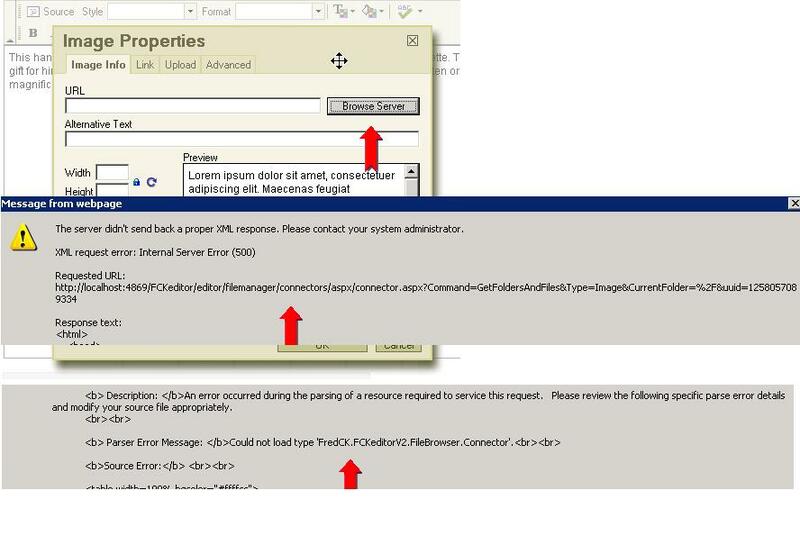 Because the connector.aspx is using the new version of DLL which is not available, so we are getting the error as highlighted in the screen shot. Can you please provide the latest DLL or advise an alternative solution.